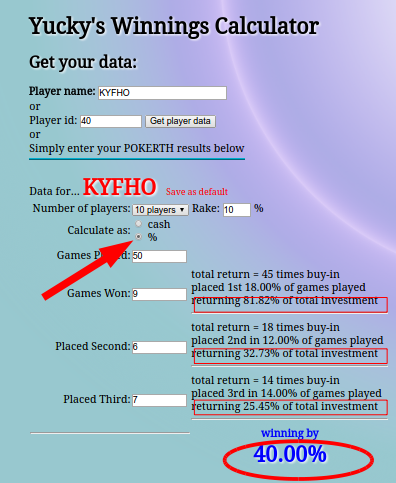 KYFHO wrote: Can you also include a ROI (Return on Investment) percentage? Today I have uploaded Version 2. Many of the changes are "under the bonnet" improvements, making use of the "web service call" feature kindly suggested by sp0ck and supernoob, to speed up data access. However I have added a pop up menu, a choice of styles, the ability to save a default player, a link to the selected players profile page and the capability to switch between current season and all-time statistics. There are a number of other features I could add, a player comparison page crossed my mind for example, but only if the interest is there. So spread the word. To change page style - click on the menu bars in the top left corner an select a style. To save your stats as the default opening page - click on the "Save as default" button next to your username. To clear the default user: click the button that says "Clear default". To switch between Season and All-time stats: click where it says season or all-time. I think I use this more than my ranking page. Can you add the ability to search from the URL? KYFHO wrote: Can you add the ability to search from the URL? 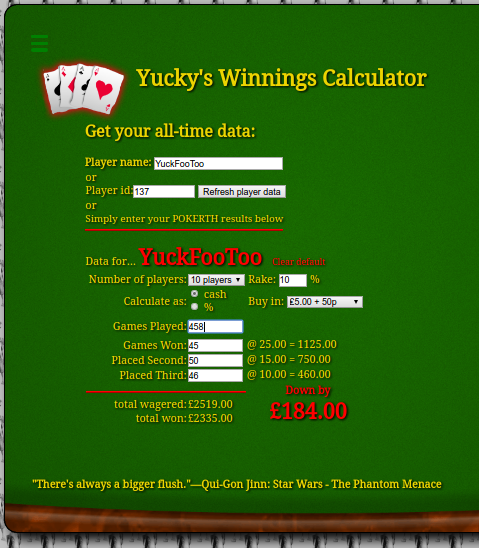 Yes I considered adding this feature but since you can't post links to my site in the PokerTH chat window without triggering a warning I did't think it was worth it. what would you want it for?